Interest in integrative studies programs has risen as academics, organizations and students recognize the value of engaging in multidisciplinary and interdisciplinary learning. These types of degrees equip students with a wide-range of knowledge as well as the critical and analytical skills needed to be successful in the workforce. Rather than focusing on a single discipline, students can tailor their studies to their academic interests and professional goals. The result is an integrative learning experience that leads to personal fulfillment, a greater awareness of social responsibility and a thoughtful approach to modern issues. These programs frequently incorporate experiential learning to supplement classroom time, including internships, study abroad programs, field placements, community engagement and service learning. 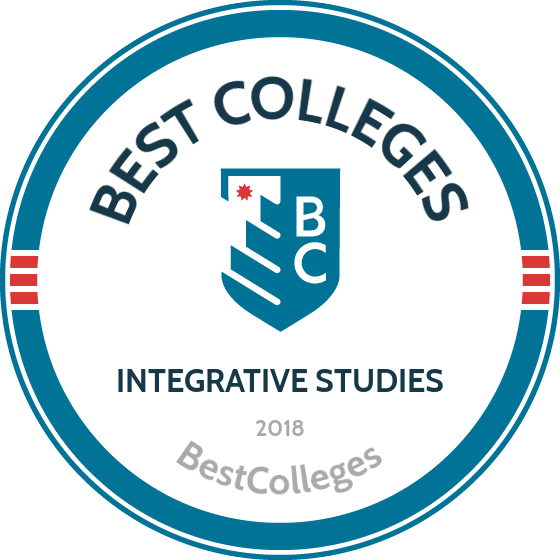 The faculty at Johnston Center for Integrative Studies were integral to the creation of this list of the top schools for integrative studies, not only by sparking the idea, but also by informing the methodology. At Emory, students seeking an innovative program may consider the Interdisciplinary Studies degree with an emphasis in Society and Culture. To earn a bachelor of arts, students must complete 44 credit hours, comprised of frame and concentration courses. The former are meant to frame the student's experience within the degree, focusing on the development of writing skills and an understanding of liberal studies. Concentration courses are focused on individualized study and are traditionally chosen by students and the Director of Undergraduate studies. The concentration courses prepare students for a culminating senior project, which is designed to showcase their ability to understand and present complex ideas originating from at least two different disciplines. While many projects are research-based, some may take the form of artistic expression or public engagement. The Interdisciplinary Studies major at Wheaton provides a liberal arts education for students looking to combine courses from two to three academic disciplines. The program also encourages cross-cultural experience through study abroad opportunities and a service-learning internship in Human Needs and Global Resources (HNGR). Students develop a "guiding directive" to inform the overall purpose of the degree; this involves selecting a question, problem and theme to explore. Once this directive has been identified and established, students work with their advisors to create an individualized curriculum incorporating the knowledge and skill sets needed to begin research. This research culminates in a final project that is presented to peers during the senior year. The IDS major also offers two preset academic programs in Asian Studies and Biotechnology. Prospective students considering this selective program must complete a comprehensive application, which includes essays of intent and an interview by the IDS director. The curriculum offered at New College provides an out-of-the-box education individually matched to the needs and goals of each student. Rather than credit hours, students undertake seven contracts to graduate, which are written between the student and their advisor at the start of each semester. These contracts typically include three to five academic activities, such as classes, tutorials, internships or independent reading assignments to further educational goals. Rather than grades, the college favors providing narrative evaluations reviewing the strengths and weaknesses of individual projects and assignments. Students also work with their teachers to design independent study projects and conduct hands-on research. Abundant modes of experiential learning are available, and students regularly take part in cross cultural and activist-based learning opportunities. This model serves as the baseline for the areas of concentration (AOC) offered by the school and serves as an alternative to the core curriculum employed by most postsecondary institutions. At Seattle University, students can undertake an Interdisciplinary Liberal Studies degree. In this program, students learn how to be thoughtful professionals who utilize the knowledge of cross-discipline study. The program requires 60 credits, making it an attractive option for those who wish to pair the degree with a second major or a minor. With other program requirements factored in, the degree totals 180 credits. Core classes comprise 25 credits in subjects such as community engagement, methods of research and inquiry and liberal studies. Students also complete a senior-level synthesis project as a culmination of their studies. The remaining 35 credits are made up of four areas, including humanities, social sciences, natural sciences and an elective drawn from math, statistics, computer graphics or computer science. The university notes that many students planning to work within education choose this degree, since it consists of project-centered coursework, leadership seminars and youth development, as well as a consortium of interdisciplinary scholars and electronic portfolios. At the University of Scranton, students can participate in an Individualized Major program if their plan of study proposal is approved. Once accepted into the program, students receive a faculty mentor to guide them through the process of creating a curriculum. The program generally consists of at least 36 credits, with approximately 15 to 18 required from a single academic department. In addition to these credit hours, students also undertake a three to six credit capstone project that integrates subject material from various disciplines. The program totals 126 credits. Students within this program receive one-on-one mentorship from their assigned faculty members, who meet with them at the end of every semester to review their progress. The Integrative Studies in Social Science program at MSU is designed to outfit students with an understanding of the social sciences and a deeper awareness of the human condition. Once enrolled, students take two specific integrative studies courses, though not concurrently. In order to provide graduates with multicultural and global understandings of human behavior, students are asked to qualify their personal ideas and beliefs through an analytical lens. This allows them to develop an understanding of patterns and trends found in how we interact with each other and our world. In addition to the core classes, students have many ISS class options to choose from, depending on their area of focus. In an effort to provide multiple experiential learning opportunities, the department encourages internships and study abroad programs. Current study abroad programs are located in Washington, D.C., Hawaii and New Orleans. At Bennington, every undergraduate student takes part in "The Plan Process," an integrative, four-year framework used to create and analyze their education. Bennington is also unique in that students are required, every year, to get work experience--a job, internship, or entrepreneurial experience--that is then integrated into their academic pursuits. From the beginning, students are asked to think about what they want to know and how they want to pursue learning it. Experiential learning is a key component; many opportunities are offered outside of the classroom, including field-work, out-of-school projects, tutorials, internships and more. Academic advisors and plan committees are in place to guide and mentor students throughout the program. The plan is divided into yearly requirements, with the sophomore and junior years reserved for deep immersion in one or more disciplines, or for answering a specific and in-depth question. The final year is reserved for taking what they've learned and exploring how their work relates to others. This often culminates in a senior project or thesis. While The Plan Process is a significant component of a Bennington degree, the school also offers a variety of majors and programs for students to concentrate their studies. The majority of programs require 128 credit hours in total. The New Century College at GMU oversees the Integrative Studies program for the university. Within this degree, students can select a preexisting concentration or create their own curriculum based on academic goals as approved by a faculty advisor. Outside of traditional classroom-based learning, experiential opportunities include studying abroad, service learning projects, internships or an alternative break. Credits required to complete the IS program vary, but the minimum is 66 credits of academic coursework. Credits are grouped into a variety of learning blocks, such as learning communities. This is a 24 credit block comprised of interdisciplinary courses that help students explore multiple ways of understanding a topic via team teaching, collaborative projects, writing and critical thinking and independent study. The experiential learning block is 12-24 credits and includes opportunities for internships, study abroad, service learning, field trips and field study options. The concentration block accounts for 30-57 credits and is considered the equivalent of a major at other colleges. While the program has 11 preexisting concentrations, students may also create their own. At North Central College, the Interdisciplinary Studies program has several existing majors and minors, including East Asian studies, environmental studies, gender and women's studies, history of ideas and global studies. Preexisting programs incorporate different learning styles, such as team teaching and international course clusters. Additionally, students take a cluster of intercultural seminar courses intended to expand their worldview. The New College at the University of Alabama administers the Integrative Studies program at the school, ensuring students complete their core requirements and College of Arts & Sciences classes in addition to the unique New College curriculum. All students within this program create a "depth study," their own map for an individualized program of study. Customized degrees incorporate classes from across disciplines and bring in experiential methods of learning such as internships and study abroad programs. In addition to core and program requirements, students must learn a foreign language to the level of ‘proficient' while enrolled in the New College. During their final year, students undertake a senior project to be presented at the department's Senior Research Symposium. In addition to theses, other projects have included community development initiatives or creative arts. Simpson College offers an Interdisciplinary Studies degree which includes courses from several majors, including biochemistry, forensic science, neuroscience, international relations, sustainability, Latin American studies and art history. In addition to existing programs, students showing exceptional promise may be allowed to create their own independent interdisciplinary major (IIM), which outlines a degree program built to suit individual interests and aspirations. No matter which path students select, they participate in a variety of experiential learning opportunities, including cross-cultural learning initiatives and internships. Toward the end of their time at SC, students participate in a capstone experience; many students conduct a summer or campus research project, culminating in an extensive written project and presentation. All undergraduate students at Hampshire College undertake a learning program quite different from the traditional college experience. Rather than progressing through their studies in the traditional manner (i.e. freshman, sophomore, junior, senior), students complete three levels or divisions of study. The university believes students should have the opportunity to explore a variety of disciplines through a wide lens, allowing them to become independent thinkers and problem solvers. Division I provides a liberal arts foundation and develops four skills that the following two divisions build upon. Division II is comprised of two years of study, with a focus on students exploring their chosen concentrations via class work, independent study, internships and field work. Students are also required to complete a community service component and show thoughtful engagement with multiple cultures and perspectives. Division III allows students to focus on a major independent project, which can be focused on answering a question, exploring an idea or developing research on a specific topic. Students take their findings and incorporate them into the academic community at large by participating in upper level coursework, internships or positions as teaching assistants. The program is typically comprised of 128 credit hours. Mount Union utilizes the Integrative Core for all undergraduate students, offered as 32 credits of coursework spread throughout all four years of learning. Paired with a major, these foundational classes provide an underpinning for students to understand multiple ideas from various perspectives. Learning outcomes for this program include the development of exceptional communication and critical thinking skills. The eight required courses include a first year seminar; foundational courses in humanities, natural sciences, social sciences and arts; two theme courses; and a capstone course during the final year. The first year seminar sets the stage for the unique style of learning and focuses on a single topic as viewed through multiple disciplines. The capstone project takes a real-world issue and groups students together in a semester-long project to solve the problem. Students also compile a written and oral communications portfolio, which allows them to present their accomplishments and receive constructive feedback on how to continue developing their skills. The Interdisciplinary Studies major provides undergraduate students with a broad liberal arts education that combines courses from two or more discipline areas. Once enrolled in the program, students undertake 44 credits from areas of arts and fine arts, English and modern languages, social and behavioral sciences and philosophy and theology. The interdisciplinary studies major requires earning 45 credits. Typically, students combine two or more areas of concentration, with each concentration requiring a minimum of 21 credits. A senior project adds three to five credits and usually involves a significant research project, creative arts portfolio or other project as developed by the student and their advisor. Electives total 38-39 credits, creating an overall program of 128 credits. During their studies, students take part in a variety of experiential and cross-cultural learning opportunities. North Greenville University offers a bachelor of science in Interdisciplinary Studies, allowing students to combine studies from two separate discipline areas. These personalized degrees encourage students to explore complex issues and develop solutions to modern problems. Students can use the liberal amount of electives available to add a third discipline area to their degree plan. To fill the general education requirement, students must earn 44-46 credits, and the Interdisciplinary major requires a total of 46; elective coursework comprises 36-38 credits. To graduate, students need a total of 126-130 credits. The university offers a variety of pre-existing concentrations, including accounting, biology, business administration, computer science, economics, marketing, mathematics, psychology and sport management. Radford's College of Humanities & Behavioral Sciences offers an Interdisciplinary Studies in Liberal Arts program for undergraduate students seeking to engage in a personalized, interdisciplinary course of study. The program allows students to combine two disciplines of study into a customized program, after presenting an evidence-based educational plan that details why their goals will be best achieved through creating a unique major. Core curriculum courses are comprised of 43-45 credits, while the major itself adds another 49 credits. All IDSL majors are required to complete 13 credits of coursework specific to the program, including classes in written and oral communication, research methods, an immersion experience entailing independent study and a senior seminar. An additional 6-12 credits are required if students are pursuing a bachelor of arts or science degree. All students are also required to complete an integrated learning experience, which often takes the form of an internship. At PSU, the Interdisciplinary Studies is offered as a BA or a BS and combines coursework from two or more disciplines. PSU does not have any pre-existing interdisciplinary degrees, meaning students can design a program that is unique to them. Examples of recent individualized degrees include expressive arts, dance management, international adventure tourism and women and political change. A snapshot of the required coursework for the program shows the breadth and depth of work students undertake, ranging from food issues and applied ethics to personal mythology and the ice age. The program is well regarded among practitioners; it's one of fewer than 50 programs nationwide that is a supporting member of the Association for Interdisciplinary Studies. In addition to this major, students can take advantage of numerous IS minors, including peace and justice studies, neuroscience or Latin American studies. At Winthrop, undergraduate students enrolled in the bachelor of arts in Individualized Studies receive an immersive and holistic education that addresses their goals and interests. The program's mission is founded on the exploration of topics unable to be defined by a singular discipline. Students are encouraged to participate in experiential learning, such as internships, service learning and study abroad trips. Throughout the course of the program, skills learned include advanced written and oral communication, the ability to synthesize knowledge, analytical and critical thinking and collaborative work. A strong awareness of cross cultural learning is also woven throughout courses. The degree requires at least 124 credit hours to qualify for graduation, 36 of which must be directly related to the student's major. Students also complete an individualized studies project and a senior capstone. Interdisciplinary Social Sciences, offered through the College of Arts & Sciences at USF, is designed to provide a broad educational experience to students. Within this program, students select two social science concentrations to form their major, with the option to incorporate a third area as their minor. Recent concentrations available include anthropology, criminology, environmental science, gerontology, history, international studies, political science, psychology, religious studies, social work and sociology. To complete the major, students are required to take a minimum of 39 credit hours. Dual concentrations need at least 12-13 credits in each concentration to be completed; the degree core classes add 15 more credits. Toward the end of their undergraduate educations, students take a senior capstone class and create an original, independent study project. The degree allows for more electives than a traditional program, and students are encouraged to pursue a minor with these extra courses. Minors available to ISS students include anthropology, business, criminology, English literature, business and technical writing, history or leadership studies, among others. The Liberal Studies department at GVSU allows students to create individualized curriculums of classes pulled from departments across the university. Students begin their time in the program by completing a core set of required classes. These classes lay the foundation for critical thinking and communication skills while providing cross-cultural viewpoints. Students then design their own major with the help of a faculty member; generally, these majors are developed with a specific interest, issue or theme in mind. The degree is divided into 18 credits of core requirements and 18 credits from the area of focus. These are taken in conjunction with electives and five or more credits in application and synthesis. These can be thought of as capstone classes, providing supervised work experience and the ability to present research in a public setting. Popular forms of this exercise include an internship, case study, field placement or attendance at a conference. The College of Liberal Studies at UO administers the Bachelor of Arts in Liberal Studies program, offering students wide-ranging exposure to ideas, theories and frameworks to utilize throughout their lives. Students are familiarized with the humanities, natural sciences and social sciences, creating a classical liberal arts education. All courses are delivered in an accelerated format; each course is eight weeks long. Additionally, it is one of the few programs that can be undertaken entirely online, in a hybrid format or as a traditional classroom-based degree. While the degree requires 126 credit hours for graduation, the fast-paced nature of the program means it can be completed in as few as 18 months. Of these required credit hours, at least 40 must be considered upper level coursework. The curriculum offered at Evergreen State College is unlike most others. With the slogan "Beyond formal majors," students select an area of emphasis from more than 60 subjects, and they create their own plans of study totaling 180 credits. Without the requirement to take specific prerequisites, students are able to design personalized majors that fit their future goals. Faculty members and advisors lead students through the entire process, ensuring they graduate with a degree that will propel them forward. Rather than offering courses in single disciplines, the classes at Evergreen are all interdisciplinary in nature, combining multiple subjects to present a holistic learning experience. The university also doesn't assign letter grades; instead they provide narrative evaluations to help students see what they've learned and how they've progressed. In addition to their classroom-based courses, students participate in research projects, internships and focused courses allowing for independent study. Daemen College recognizes that modern life often requires a multidisciplinary approach. This understanding led the college to create the Interdisciplinary Program, a 120 credit degree encompassing studies in cooperative education, environmental studies, forensic studies, individualized studies, international studies and military science. Outside of classroom learning, students regularly take part in experiential and cross-cultural opportunities, such as fieldwork, study abroad trips, internships and independent study. A quick glance at the core curriculum shows the breadth of knowledge students will gain through a range of classes including, among others, Polish culture and alternative and renewable energy sources. Students complete a senior project to showcase how their blended studies have culminated to answer a significant question, address a theme or explore an idea. Coastal Carolina University offers a Bachelor of Arts and a Bachelor of Science in Interdisciplinary Studies for students who seek an untraditional learning experience. The individualized nature of the program allows students to build a degree suited to their learning objectives and professional goals. Accepted students must demonstrate how their proposed program of study stands outside existing majors. The degree is 120 credit hours comprised of foundational courses in technical and professional writing and an introduction to interdisciplinary studies, alongside a major concentration and six hours of research project credits. The major credit hours are earned in the core of their individualized concentration area. Recent student-created concentrations include talent management, photojournalism, nonprofit activism and organization and scientific illustration. Students also take part in one or more internships during their time at CCU and can engage in other experiential learning opportunities like field placements and study abroad trips. The Self-Designed specialization offered by FDU is a 30 credit hour program that allows students to explore a variety of topics or disciplines. Students enrolled in this program work with a faculty mentor to design a specialization that uses multidisciplinary and independent study components. While not a full major, students can use the specialization as a springboard to learn about contributing areas of thought that will be helpful to their future endeavors. A recent example from the university explains that students who want to become specialized journalists should consider creating a specialization combining literature and creative writing with focused topics such as science or mathematics. The Interdisciplinary Studies major at WSSU has two main functions: to provide a general degree completion for adult students, or to provide motivated traditional students with an outlet for creating their own degree. Nontraditional students often follow this path when they already have two years of general education coursework from prior education and seek to complete an undergraduate degree. Meanwhile, traditional undergraduates who feel their area of interest is not covered in an existing degree program can tailor their own course of study. Regardless of their background, students take part in 30 hours of "depth study" courses in areas of integrative studies, sociology, psychology, history, art, music, math, biology, mass communications, chemistry or physical education. The Hutchins School of Liberal Arts at SSU offers a Liberal Studies major that allows students to create an individualized plan for learning. Curriculum is presented through seminars, workshops, independent study projects, internships and study abroad trips. In addition to major-specific coursework, all students undertake classes in introduction to liberal studies; the practice of culture; and a variety of courses around directed study, core seminars and a senior synthesis. While in the synthesis course, students work alongside one another as they complete independent culminating projects. Major specific requirements include 40 credit hours of study across disciplines such as artistic and creative endeavors, scholarship investigations, community projects and community action opportunities. The Honors Program at Saint Leo is divided into a sequence of six interdisciplinary courses, which are taught during students' first three years of study. The final year culminates with a significant capstone project that demonstrates the knowledge students have gained and propels them into the view of potential employers or graduate schools. The program is composed of 150 students who share a commitment to academic excellence and intellectual pursuits. Those within the program are recognized as gifted and highly engaged individuals, within the classroom, the campus and the surrounding community. Given the small size of the program, students work closely with each other, faculty and advisors. In addition to university standards, the department has several criteria for eligibility that must be met before admission is granted. At Ferris State University, the Bachelor of Integrative Studies (BIS) is an attractive option for students who seek an integrative, multidisciplinary learning experience. Many students in the program have multiple areas of interest, and this degree allows them to combine them into a cohesive curriculum. Degree requirements include the completion of 120 credit hours; at least 40 credits must be at a 300 level or above. Before beginning their individualized program, students must first prove that they would not be better served by an existing bachelor's degree offered by the university. While enrolled, students are strongly advised to complete an internship as a means of broadening their experience. The Interdisciplinary Studies department at NSU is focused on building five core skills: critical thinking; strong language and communication skills; excellent research and writing abilities; an awareness of and sensitivity to social, cultural and global issues; and cognizance of major ideas influencing the world. The general education curriculum must be completed before students can undertake the eight foundational interdisciplinary courses. Students select two concentration areas to develop an interdisciplinary major specific to their interests. There are also 23 credit hours of electives at their disposal to complete the 120 credits required for graduation. The university is committed to making learning both interesting and flexible; all of the foundational INT courses are offered online and via traditional methods. Classes are also offered during the day and in the evening to suit students' needs. SFSU offers a bachelor of arts in Liberal Studies for students who are looking for something other than a traditional degree program. In addition to general education core requirements and electives, the 120-credit degree is comprised of 46 credits of interdisciplinary coursework in liberal arts topics. This diversified education prepares students to be competitive in myriad fields and is especially popular for those who aspire to become teachers. Students within the program must select an emphasis pattern to guide their studies, with a minimum of 12 hours of their major selected from this area. Emphasis patterns include communication, language and literature; life science, physical science and mathematics; behavioral and social sciences; creative arts and humanities; and integrated studies. Recognized as a university-wide degree program, the Bachelor of Integrative Studies at Oakland University allows students to pull coursework from numerous disciplines to create a plan of study tailored to their individual needs. The cross-departmental nature of the degree gives students the opportunity to interact with their peers and the faculty of varied backgrounds. The degree requires a minimum of 124 completed credit hours and is an attractive option for first-time undergraduates and students who have completed previous coursework at another institution. At least 32 credits must be at 300-level or above, and at least 32 credits must be completed at Oakland. Students round out their time in the program by undertaking a major capstone and writing intensive course at the 400 level. At Indiana State University, motivated students can enroll in the Multidisciplinary Studies major, a bachelor of arts or science program comprised of 120 semester hours. Admission to the major is granted unconditionally to all incoming freshmen. Students must submit a concentration proposal by the end of their first semester after being admitted. This document outlines the individualized study plan they have created in concert with their advisor and must include a minimum of 42 credit hours. Of these required hours, no more than 24 may come from a single discipline, and no more than 24 can be selected outside the College of Arts & Sciences. Courses specific to the degree include an introductory class on learning liberal arts and sciences, an individual study component and a required field study or internship. The Bachelor of Liberal Arts at UAS is designed for students who seek something different from a traditional learning experience. The core curriculum blends humanities, math, natural sciences and social sciences to create a multidisciplinary learning experience. The degree is comprised of 120 credit hours, including 35 in general education, 60 in liberal arts credits and 25 reserved as electives or for a minor. Students enrolled in this program select an emphasis which allows them to focus their studies around a particular area. They may choose to continue on an interdisciplinary path, follow a designated path or create a focus of their own. No matter the emphasis, no less than 24 credits must be upper level, at least 18 must be completed at UAS and students must enroll in a senior capstone course. Governors State University offers a bachelor of arts in Interdisciplinary Studies for students seeking flexibility and innovation in their learning experience. More than other programs, GSU's degree caters heavily to the nontraditional learner who has completed some coursework previously or is looking for a flexible educational environment. Courses are offered at convenient times, and students can sometimes translate previous life experience into college credits. Proficiency exams, military service and a prior learning experience portfolio may be used as evidence to support college credit. The 120-credit degree is composed of general education requirements, electives and major-specific coursework. Students select courses from existing programs to meet their needs. Currently, students can select from 27 minors and seven certificate programs. This list was created after conferring with faculty at Johnston Institute for Integrative Studies at the University of the Redlands. After developing a list of factors considered relevant to the evaluation of integrative studies program, data was collected from IPEDS and individual school websites to create a set of ranking factors. Unlike most rankings, traditional indicators such as admission, enrollment, retention and graduation rates played less of a direct role in understanding the excellence of each program. The initial list was built from a set of schools who are members of one of the two respected integrative studies associations, suggesting a commitment to developing and improving integrative studies theory and technique. After creating a set of ranking factors, each one was assigned a weight to represent the degree of importance it held. Based on the outcome of these factors, the final ranking order was assigned. Four schools on this list were missing data that was central to the ranking calculation. While they have not been assigned a rank based on our methodology, we felt they still deserved a mention and tied them for number 34 on our list.